The Asia Boating Awards are coming up soon and this year we really want to see Hudson Yacht Group and HH Catamarans nominated. Therefore we need your vote! It has been a great year for the company. HH66-01 'R-Six' successfully launched last April and was quickly followed by HH66-02 'Night Fury' and HH66-03 'Nala' and HH55-01 'Minnehaha' launching earlier this month. All these boats are eligible for nominations, but I think it might be best to focus our votes on HH66-01 'R-Six'. This will maximize our chances of seeing HH Catamarans nominated. Below is a link to the nominations page. It will take a few minutes to complete but as is always the case with these things, every vote counts! Some categories require a description an image to be uploaded. Use the information below to copy and paste. The deadline for nominations is midday on Sunday, 12th March, Hong Kong time. right click to save image to your hard drive. 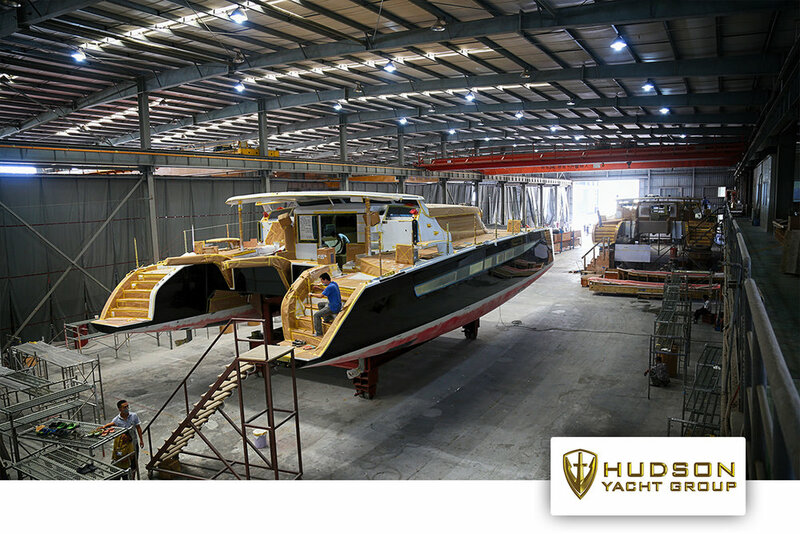 Description: Through concept and design, manufacturing, sales and service, Hudson Yacht Group delivers boats of the highest quality and stands behind every one of them. They offer semi-custom and production yachts unlike anything on the market thanks to an unmatched combination of strengths: an award-winning design group, a master boatbuilding team, the credibility and longevity of a manufacturing powerhouse and an intricate network of the world's best sales and service professionals. Hudson Yacht Group's wholly owned yard is in Xiamen, China. An international team of designers, project managers and veteran boatbuilders leads a 300-person production staff in a state-of-the-art facility. Description: Faster, stronger, smarter and more lavishly appointed than anything that's come before it, the HH66 sets a new standard for luxury cruising and performance. Together with world renowned naval architects Morrelli & Melvin, HH Catamarans have created a cruising cat that outperforms anything of equivalent size and class - anywhere. Generous interior spaces and clever use of ultra-modern materials bring a level of luxury not found on any other cruising catamaran. Every line, every curve has been carefully considered and meticulously reworked to achieve the ultimate alchemy of beauty, performance and luxury. Description: An exquisite amalgam of style, speed and manageability, the HH55 is a fast, blue water yacht prepared to sail anywhere in the world. In keeping with their commitment to luxury and excellent performance, HH Catamarans have built this yacht to emphasize the safety, strength and weight saving properties that only carbon can offer. Like the HH66, the HH55 features curved "C" daggerboards and T-foil rudders for greater performance and a smoother ride. From the desk of world renowned designers Morrelli & Melvin, the HH55 is a truly dual purpose yacht, poised to go further, faster, in ultimate comfort and style. Description: Hudson is the owner and founder of Hudson Yacht Group. An extremely experienced and successful manufacturer, Hudson's business enterprise includes the production of goods for many of the world's best known sporting equipment brands. In 2009 Hudson began to focus his business and manufacturing skills on his passion for boats. He established HYG and began building partnerships with world renowned brands like Gunboat, J Boats, and luxury British yacht brand, Pearl. Through these partnerships he began to work towards his personal mission - to build the world's finest yachts for both the Asian and world markets. After many successful contract builds Hudson set his sights on developing his own brand of world class yachts, and thus HH Catamarans was born.